Like any good design, the style of your patio depends on what the rest of your home’s theme is. You may not notice it, but your home has a theme baked in to its appearance. Every home draws from some source of inspiration somewhere. That inspiration could be regional, modernized, or it could be based on architecture extracted from the past – or it could be all of those things. A patio’s job is to act as a congruous threshold between home and land. 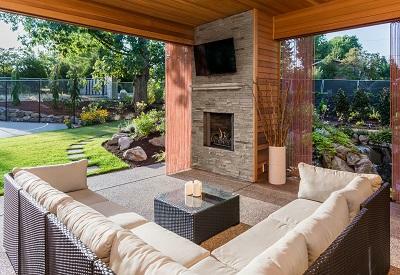 Not inside, but not all the way outdoors, a patio binds the comfort of your home to the world outside. Smart design and a good sense of a home’s thematics can create a patio that’s always inviting and built for sanctuary. Let’s look at some ideas. For a lot of people, when they think “patio,” they’re thinking of a flat surface outside in the classic “veranda” style. Complete with a roof or vine-covered crossbeams for sun protection, a stony or wooden veranda is perfect for homes looking to cohere with the lushness of the PNW. Patios may also be sunken into the yard to create a natural blend of home and environment. 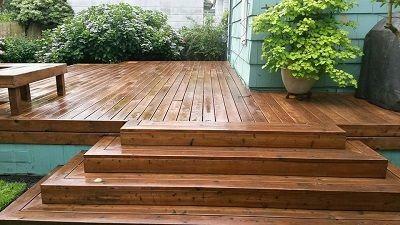 They can stand alone or be incorporated into another patio design. Burrow it into your backyard with tiered stone seating for a mini backyard amphitheater or for the perfect place to read, enjoy a meal, or watch the kids play. For properties with the space, a central patio connecting the home to the rest of the property via a wandering walkway may be an organized but organic means of tying everything together. 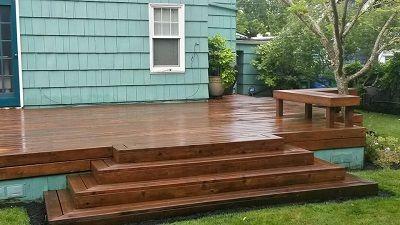 And after a few seasons past, your walkway patio will be rooted to the earth with natural moss and overgrowth. Horseshoe or L-Shaped homes may benefit from connecting two entryways with a fully or partially enclosed patio. Especially for homes with a u-shape, an open-air patio provides secluded access to the outdoors and has the added benefit of a convenient passthrough within the home. For many homes, a patio goes hand-in-hand with getting a (long-awaited) backyard hot tub. For patios serving as a hot tub stage, we typically recommend a porous stone surround or a non-slip composite material for a safe surface. An easy touch for the perfect ambiance is to include dedicated posts for subtle stringed patio lighting. Of course, any style can be mixed and matched, and elements of any patio style can be added on to another. Any one of these styles can incorporate trim or stylized accents to make sure it’s not out of place with the rest of your home or yard. You may also want to include other details that help bring your patio to life. Built-in gazebos for coverage from the rain (or just the inserts for those who like the removable canvas style) work well with just about every patio option. Railings are available for any patio we build, or a more modernized style, patios can be outlined with safety lights for an aesthetic boundary marker. Feeling inspired but don’t know where to begin? Our design consultants can get you going. Give us a call today.